Dedicated to enhancing the work of journalists and promoting effective governance using technology in Africa, Penplusbytes has published the first comprehensive Social Media Index(SMI) report on Ghana's print, and electronic media - Radio and Television. The SMI report assesses and ranks the vitality of Social Media platforms managed by various media outfits in Ghana by reviewing their numbers of followers, page Likes and to a considerable extent, regularity, interval of posts and level of engagement. This feeds into determining which outfits are best represented on Facebook and Twitter by media type. The report looks at the performance of established newspapers, radio and TV stations in Ghana regarding their activity and following on social media as at early February, 2016; measuring how these media entities utilize their online platforms to reach out and engage their target audiences by employing a quantitative research module. This module provides relevant numerical figures which informs the rankings. 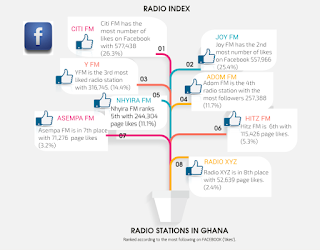 According to the report, which is downloadable here, media outfits, Citi FM and Joy FM demonstrate immense influence on Facebook by coming tops in first and second place respectively. Other radio stations that include YFM, Adom FM and Nhyira FM closes out the top 5 radio stations with the most page likes and following on Facebook. Joy FM and Citi FM, again, ranked in 1st and 2nd place respectively as the two stations with the most following and engagement on Twitter. Other highly ranked stations include YFM, Live FM, Starr FM and Peace FM, in that order. The report spells out in details similar indices on Television and Newspaper outfits in Ghana. According to Kwami Ahiabenu, II, Executive Director of Penplusbytes, there appears a shift by Ghana’s newsrooms towards the integration of new media strategies like social media in news dissemination. “This report essentially evaluates how visible such entities presently are on social media - Facebook and Twitter specifically, as indicators of the extent to which they are engaging their audience in a virtual space,” he stated. As internet penetration increases and more people get onto Social Media Platforms, it is predicted that journalists and newsroom managers would slowly but surely transition to becoming more relevant on social media in order to connect with the public and promote themselves and become even more germane in this digital age.